For a standing desk in the library. Y’all, the ZSR Library on campus has a few of these wonders tucked here and there—standing desks! Have you ever used one? Well, I have stood up to work before, but it was definitely a make-shift shift situation. I’ve perched my laptop on a just-too-tall bookshelf and spread my papers on a low table before me. But this, THIS, was a different experience all together. There is a little crank on the right-hand side that allows anyone to lower or raise the desk to their personally perfect height. I was so impressed with my experience—before I knew it I had been standing for almost 2 hours! Just realized I am going on and on about a desk. Well, I AM a student, and I AM cultivating gratitude here. Something that positively impacts the hours I spend pouring over books and spinning out projects in the library is definitely worth the mention. Give it up for standing desks! That we live in a world with Octobers—and free printables! 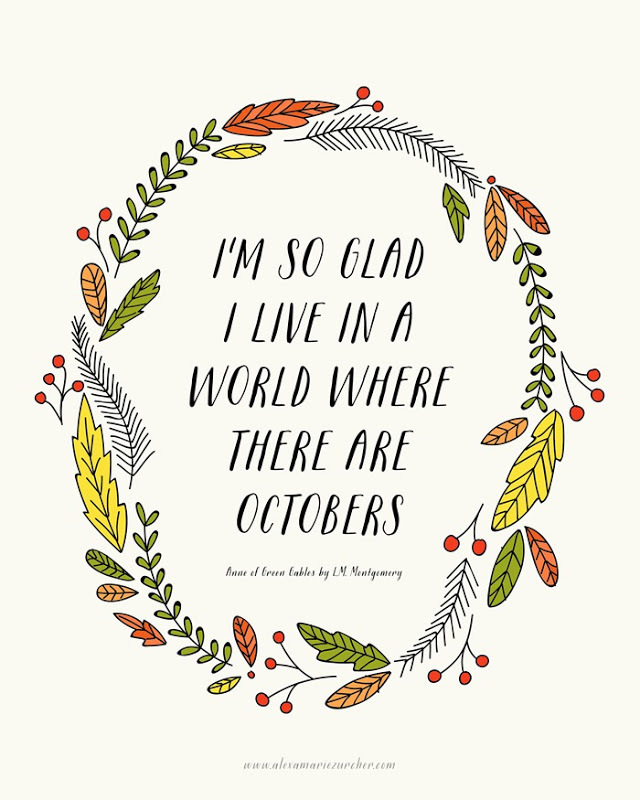 Anne of Green Gables always makes me smile, and I wholeheartedly agree with her about this particular month. Here is a link to a free printable (pictured above) that I found on the internet. Since I gushed about fall in this gratitude post, so I’ll hold off on that today. ;) But I’d love to know what YOU dig about October. What are your favorite autumn traditions? What about this season sparks gratitude in you? For friends who pull me in, ask me questions, hug me hard. One of the ways I see God cultivating good in this weird time in my life is through the love of my friends. I am more dependent upon them than I have ever been in my life. And that is a good place to be. Due to internalized lessons from a childhood spent moving from place to place and the underbelly of a marginally evangelical upbringing, I held myself back from friends for most of my life. I tried to make myself strong enough to endure life on my own. Of course, I am and have always been an independent person. Interdependence has earned its rightful place in my life since childhood, but what I am talking about now has more to do with vulnerability. During the tumultuous teenage years, I tried to make myself unhurt-able, which really translated into untouchable and apart. I learned to keep friends at arms-length. To be stingy with trust. To manage on my own. That is too much for any person to do, much less a young woman with the whole of adulthood ahead of her! Humans are not meant to be alone. The past five or so years of my life have been a richly intense time of redemption, reconciliation, and blessed risk in this area. In some ways I feel that these three months of express vulnerability and interdependence is being transformed into yet another phase of my healing. I thank God for my friends. The ones who pull me in, ask me questions, hug me hard. I thank them for the ways their imperfect and wonderful love gives grace purchase in my life. I am thankful that the walls come tumbling down—that love makes perfect room for each of us without need of fortification. That I get to see Aaron again in 2 weeks. Some iteration of this will always be a gratitude, FYI. Whoop! For easy recycling here in Winston-Salem. Because my partner is a selfless and servant-hearted super hero, I never once had to take the recycling away while we both lived here in Winston-Salem. Because I am the only one who knows where the recycling center is between my roomies and me, I have become the recycler! It is quite satisfying, I have to say, to roll up, toss our carefully diverted recyclables into the bin, and drive on back to the apartment, easy-peasy. However, I am thankful that we have this bandaid for the moment—and I am thankful that it is so easy to do. This has been a week of good dreams, sweet dreams. Maybe it’s been that coming harvest moon. Maybe it has been the love of my friends sneaking ye even into my sleep. Maybe I’ve just been able to sleep enough! At any rate, I am thankful for the nature of a good dream. I cannot claim responsibility for them in any way. They are just interesting little worlds of—what? Entertainment? Imagination? Grace?